The 4th of July is just over a month away, and our friends at the Three Tree Point Fireworks Fund are seeking Business Sponsors and donations to help raise the $30,000 needed to continue this great local tradition. 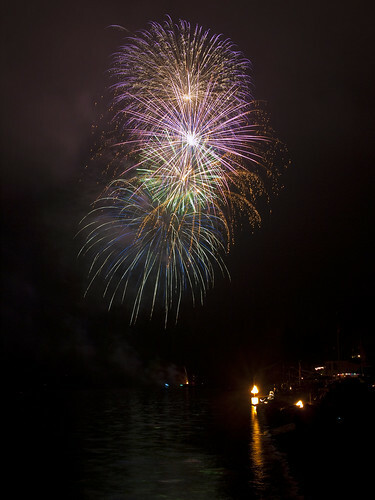 Each year, Burien’s Three Tree Point neighborhood puts on the best barge-based, high-altitude professional fireworks show in the city on the 4th of July – a great, grassroots event where local businesses get excellent, direct exposure to local residents. The temporary population of Three Tree Point swells so much to take in the fun that organizers must hire off-duty police just to direct traffic. Well, the event is a spectacle that the neighborhood cherishes. BUT it is an expensive event to stage. It is entirely paid for by donations from the community. This year it will require about $30,000 for the fireworks, tugboat, hiring off duty police officers, renting a dumpster , purchasing the required insurance and permits, and many other details that all add up. If you are approached to donate to the 3 Tree Point Fireworks Fund by mail or you see the thermometer signs with the websites please consider giving what you can. This won’t be matched by public money it is just us, the folks who love the 4th and the spectacle that celebrates our independence for over two hundred years. Isn’t that worth a few dollars to see and to know it is YOUR display? This display is enjoyed by thousands of area residents, but it can’t be continued without donations – this is an all-volunteer non-profit organization that must raise $30,000 to keep this grand local tradition alive. For more information on becoming a Business Sponsor, please e-mail [email protected]. The 4th of July fireworks display at Three Tree Point is a treasured community tradition. At the Three Tree Point Fireworks Fund we appreciate your support in years past and invite you to sponsor our 2014 event. In recognition of your sponsorship we will post your logo and link on our website, and on our event banner, and mention you for a special thank you at our donor party. This year’s sponsorship levels and commitment form are attached. This year we are also offering you Naming Rights. You have an opportunity to promote your business, honor someone special or publicize a charity you support. Let us know if you would like to explore Naming Rights. For your sponsorship to be included in the recognition, submit your contributions by Friday June 20. Sponsors will be presented at the donor party on Saturday June 28. This year our fund raising goal is $30,000. The increase is due to the general growth in the costs of all the ingredients of this event. The largest single factor is a $3000 increase in the fireworks. The associated barge rental, tug rental, crew costs add still more. The leaders of the fund always strive to provide a great experience for the audience at the best value. As many of you know, Three Tree Point Fireworks is a community-led event which receives no public funds. It is funded entirely by local residents and businesses. In addition to fireworks the fund is also used for the children’s parade and the support necessary to make the day’s events go smoothly; permits, security staff, and even the trash dumpster. As the large crowds that gather each year attest, the Three Tree Point 4th of July tradition has enduring popularity. We think that is because it is enjoyed by so many people, young and old. It reunites families and friends, draws the whole community together, and crowns our Independence Day celebration. We are looking to this year’s event, please join us! If you have questions, if you have suggestions, if you would like to volunteer for a leadership opportunity, please contact either of us. Donate Online. Just click the link below for the level you want to donate at and you’ll be taken to our credit card processing partner PayPal to complete your transaction. Donate $200 or more and you’ll be invited to the annual Donor Party on June 29th! In 2014, our goal is to keep the fireworks and community celebrations at the same great level that they have been at. This will be the fifth year we are seeking corporate sponsors for our event.